Roach miss their cue on the Middy Stick. 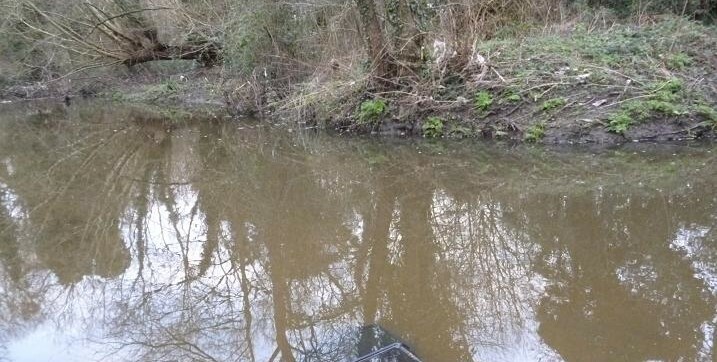 Just when I had set my sights on some winter roach fishing, it began to rain with a force not seen for years, being driven from the river during a biblical storm that brought hail and thunder, which raised water levels by two feet in a matter of minutes, as roadside drains were inundated. The rains continued for another two weeks before abating and it took the river another week to drop and fine down enough for me to pay another visit, a hard frost giving way to a weak afternoon sun. 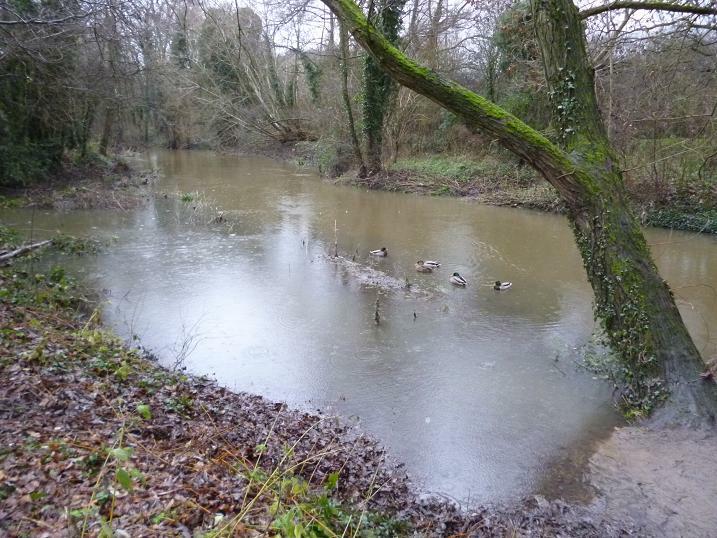 The banks were now coated with fine mud and the surrounding bushes festooned debris, evidence of the flood’s height. 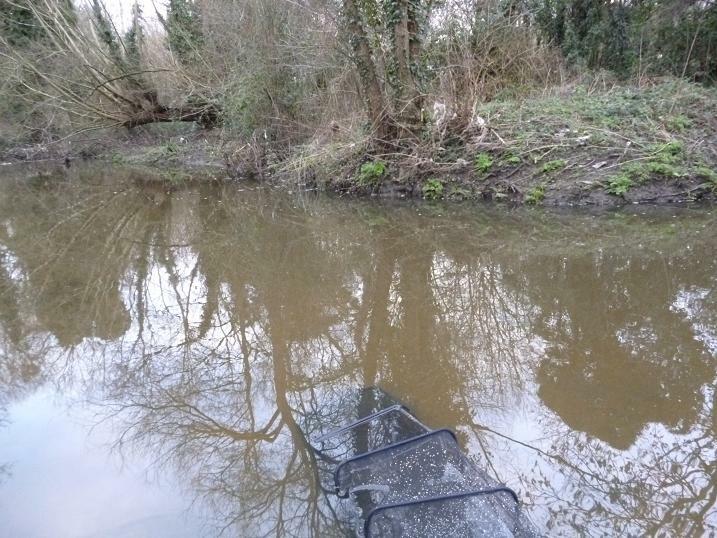 Not a pretty sight, but this swim has given me chub, roach, rudd and skimmer bream, all in the same session on past visits and I had that buzz of anticipation, as I set up my 12 foot float rod, to fish my favourite method, bread punch under a stick float. A Middy 3 x No4 bodied stick float works well on this little river, it’s ali stem and balsa body give it enough weight for casting to the opposite bank, while the tip is sensitive enough to show the slightest interest in the bait, a must have on the bread punch. These days to save time and fuss on the bank, I keep my stick floats on pole winders, a throw back to the days, when fishing with my Dad as a kid. Then I had four floats in a box, all on winders on “cat gut”, that he had made up, each with it’s own use, a roach float porcupine quill for bread, a round float with a quill through it for perch, a cork bodied double tapered avon for fast flowing water and a 1/4 inch parallel red and white plastic, flat topped float for heavy baits like cheese paste and lob worms. 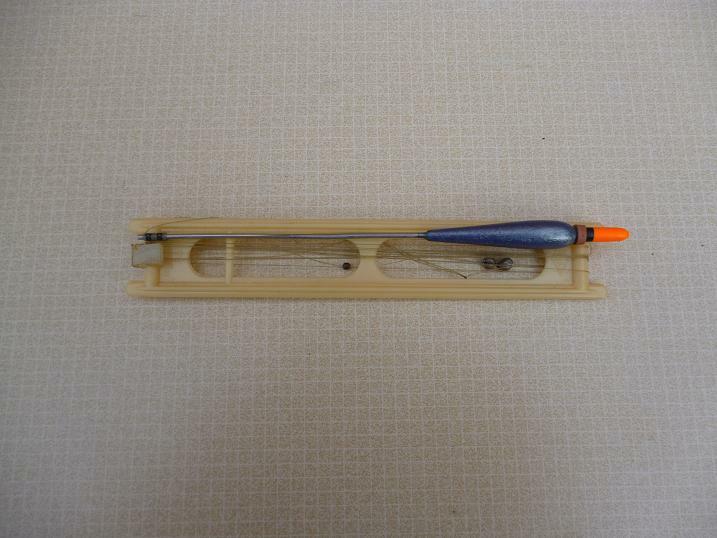 This last float could also be fished bottom end only with a bomb and paternoster rig, float ledgering I learned later. The reel was plastic and the line silk. Very ancient history, but they all caught their fair share of fish and taught a ten year old boy the art of fishing. I have never lost the wonder of watching a float go under, not knowing what will be on the other end of the strike. Back from my foggy memories, this swim has a fast run under the opposite tree, where I’ve taken chub from the roots beneath the undercut bank, the flow fanning out to steadier water on the left, where I was expecting to catch a variety of silver fish, but mostly roach. With the rod set up and everything to hand, this is always the best moment for me, what will the session bring? A 5mm pellet of bread on the size 14 hook and I was fishing, just running the bait through to search out the bottom and get a feel for the flow. Sometimes the float goes under, but not this afternoon. I squeezed a couple of balls of liquidized bread into two egg sized balls and threw them slightly upstream of me and watched as they broke up on the way down. This was like a switch being operated and the float bobbed, then disappeared. Resistance and a deep swimming fish, which pulled to the end. A monster 2 oz gudgeon. A bit of a disappointment, but a fish. Another trot and another big gudgeon. I shallowed up six inches to get off the bottom and missed a lightning bite, that tugged the line. Chub? Another ball of bread went in and I followed down with the float, which sank away as it drew level with the tree. On the lift, all went solid. The bottom? No. A flash and all hell let loose, as a chub dashed off downstream, while I back wound furiously to stay in contact without breaking the 2 lb hooklink. After a head burying session in the muddy shallows, it made an attempt to get in among the roots opposite, but pressure brought it’s white mouth out of the water and over to my net. 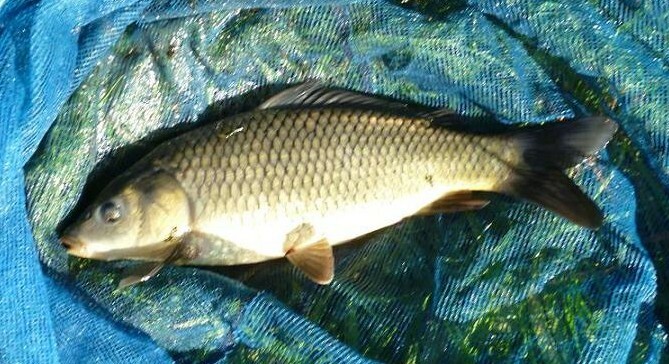 Chub are greedy fish and will always get to the front of the queue, when food is on offer and my next cast saw the float skim across the surface before it cocked and I lifted into a much bigger fish, that was heading down stream just below the surface. The chub powered away, running twenty yards, before broaching and flapping on the top. Stay on! It obliged, making another run with the flow, then turned and began swimming back, under pressure, towards me, a nice chub of two pounds. Drawing it close I realized, that the hook was in it’s gill cover, the barbless hook taking a hold, when it had swept through the bread cloud. This meant the chub was constantly swimming away from me and needed to completely exhaust the fish before I could net it. I thought I had it, the back half in the net, then the hook pulled out. Not the best of feelings. That was the end of the chub and I changed tactics, going well over depth and holding back hard, then easing the float. Each time the float eased, it sank and another big gudgeon would be battling it’s way back to the net. With the sun out, rudd had started to top well down the swim in the slower water and I shallowed right up and cast downstream towards them. 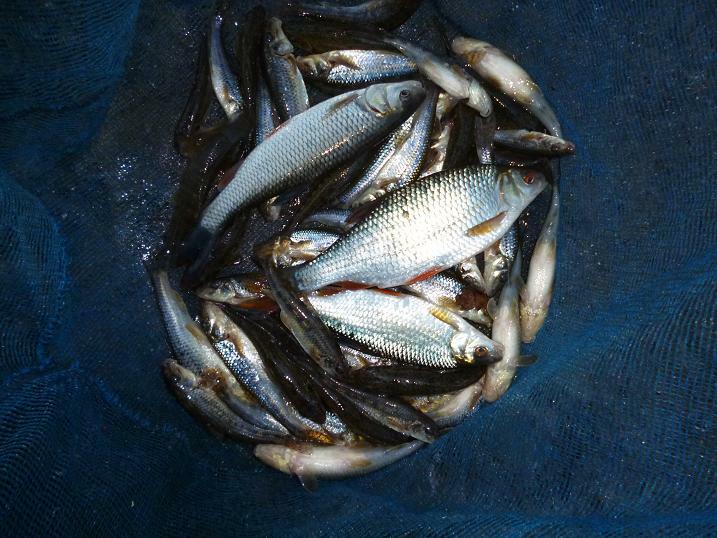 These rudd have washed down from the lakes further upstream and grow to netable sizes. 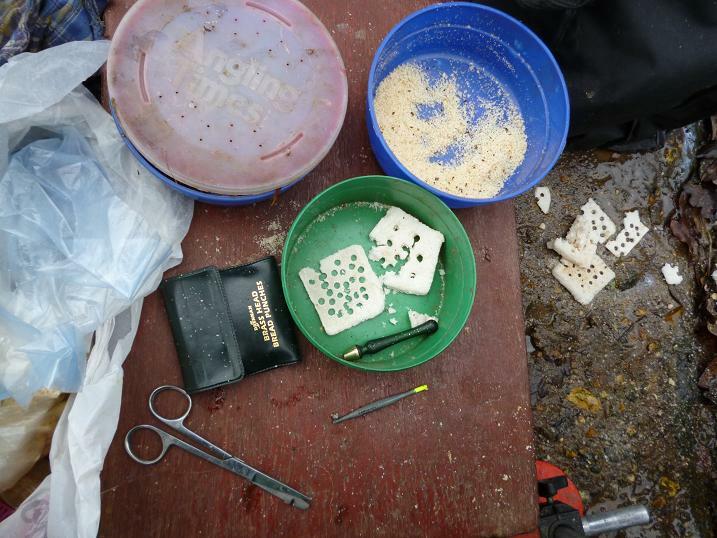 Lift bites confirmed my guess, but hooking them proved difficult, managing to drop a few on the retreive, 6 oz fish that thudded off the hook. More bumped fish sent the shoal down and out of range. This interlude had given me a rest from the gudgeon, but they were still there waiting for my return. I tried a couple more balls of bread and went hard on the bottom again, my reasoning being, that any roach present would force the gudgeon out. It worked. The float dipped a couple of times, then sank and a decent roach was pounding away, like the chub, making a beeline for the opposite bank. 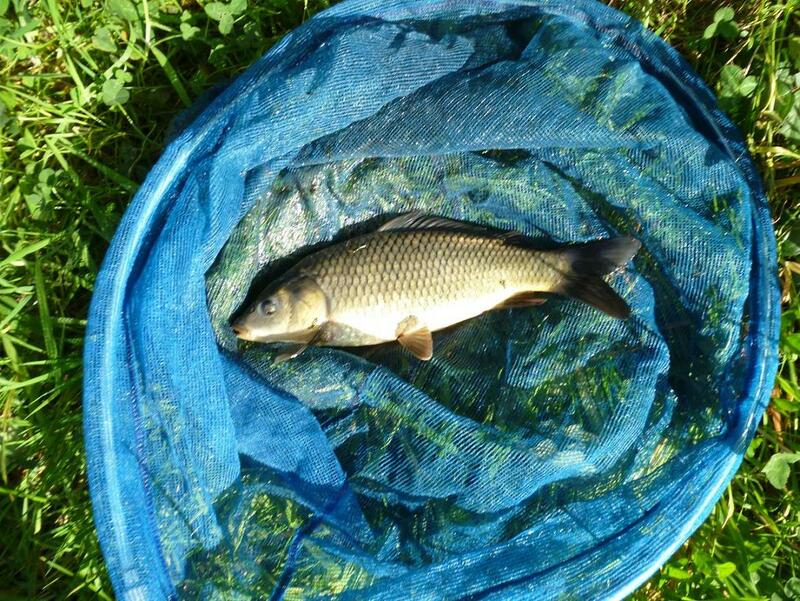 Definitely one for the landing net, this pristine roach was approaching 8 oz, very deep and round. I dropped in again, but another gudgeon. A small ball of bread was plopped in, followed by the float. It dipped and sank with a slightly smaller roach bouncing away on it’s route to the net. Cracked it! More feed needed. More gudgeon. No more roach showed and after another half hour of swinging gudgeon in; with the light going, I called it a day. 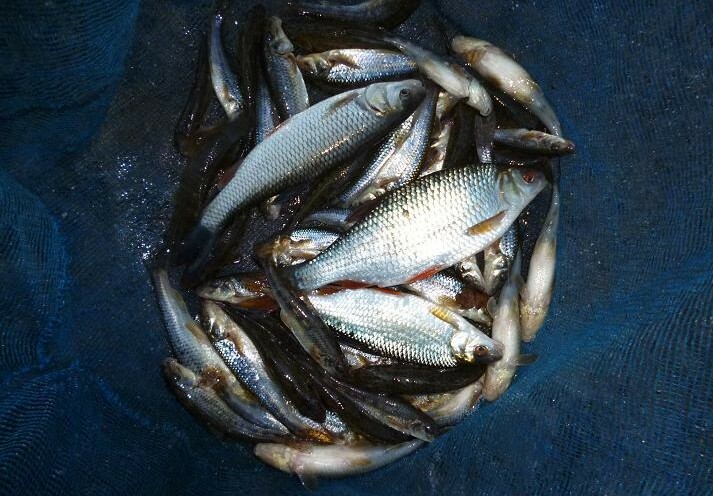 Good to be back on the river again and a busy three hours fishing, even if it did not go to script. 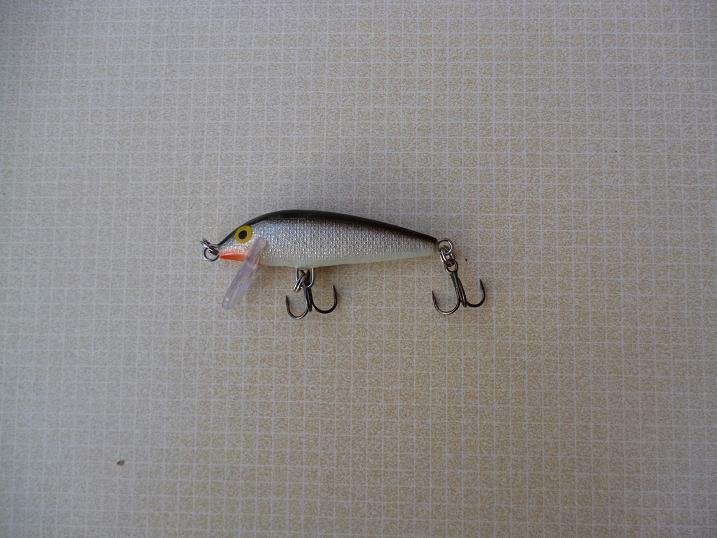 Rapala Countdown lure hooks pike trainee. Constant heavy showers put an end to any thoughts of a bait fishing trip this week, my desire to stay warm and dry, overcoming the need to catch fish. The local weather forecast had promised an afternoon of sunshine with occasional heavy showers and this was enough for me to chance a couple of hours lure fishing on the Basingstoke Canal. 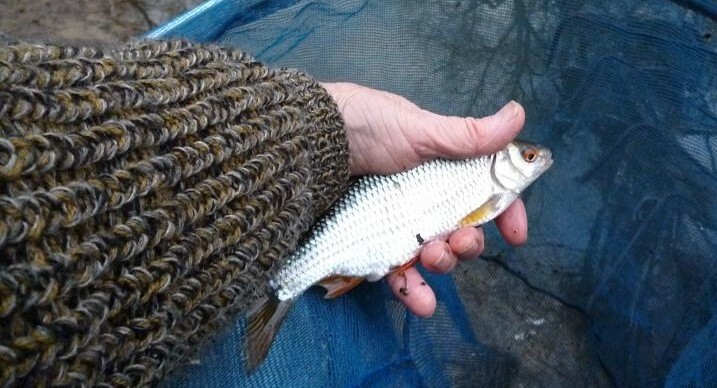 Jack pike and perch are a nuisance on this stretch, when fishing for roach, often flashing through the shoal, as a ball of groundbait goes in, or worse, taking a roach on the retrieve, which on light pole tackle, usually results in at least a broken hook link. Temperatures being mild, it seemed the ideal time to get my own back on these carnivores, while giving the opportunity to try out a new sinking lure, the Rapala Countdown. 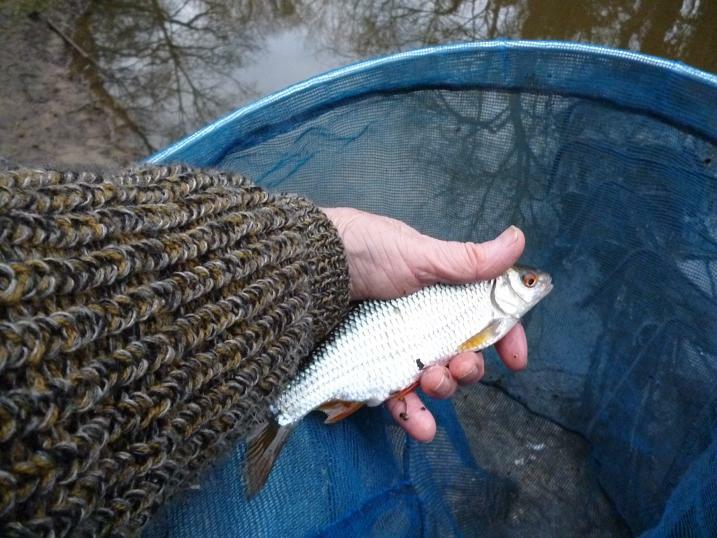 With a range of body sizes and patterns available, I chose the 2 inch long, roach lookalike and set about searching out the dead reed beds and features along the opposite bank. The Countdown has a sink rate of one foot per second and can be cast into the shallowest of water without snagging, if retrieved immediately. 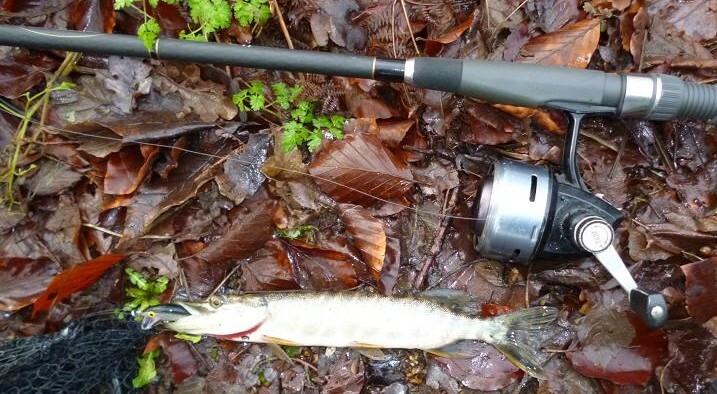 The action of the lure gives a side to side motion, causing the flanks to flash as it swims, while rapid reeling, or sharp forced movement of the rod top do not induce it to dive into the canal bed. This canal has only a couple of feet beneath the far bank trees, which drops off to 3 feet along the boat road and I concentrated on this far shelf, making 25 yard diagonal cast across the canal as I made my way along the bank. 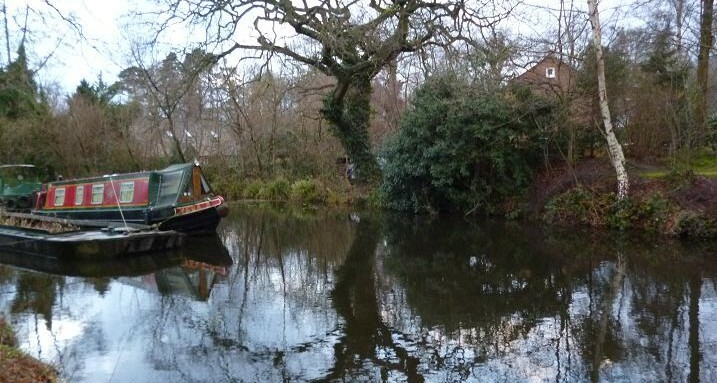 The weather forecasters seemed to have got their sums wrong and I spent much of my time sheltering under ivy ladened trees, as I worked my way towards a likely looking hotspot, where permanently moored narrow boats jut out on a bend in the canal. Like the rest of the afternoon, this area was drawing a blank, wherever I cast, whatever depth, or speed, not a touch. 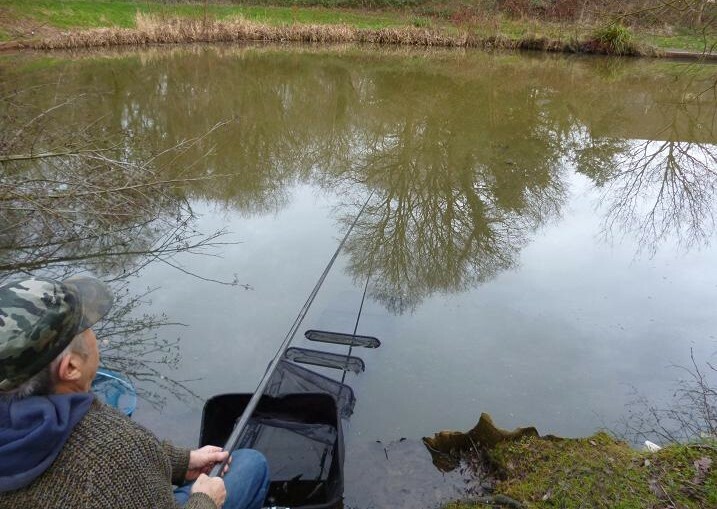 Finally, probably the tenth time I’d cast beneath a bush, the rod top rattled and pulled round. 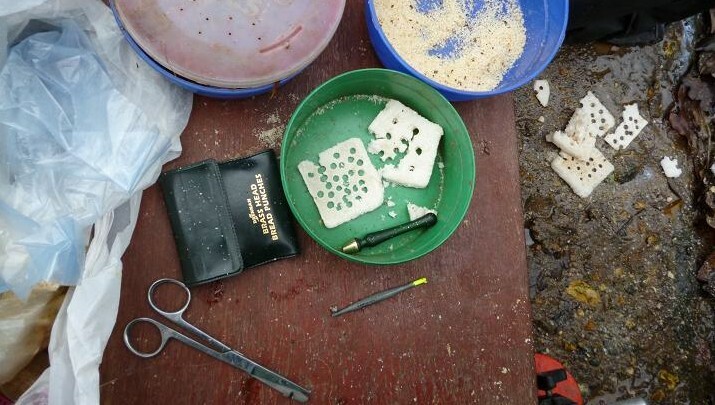 The strike brought another rattle from the rod top, but little else. Not a perch, but the smallest pike I’ve ever caught. Totally outgunned by the tackle, I swung it in to hand. As can be seen from the photo, this little 10 inch jack really wanted this Rapala, two of the rear trebles hooked neatly in the gill rakers. 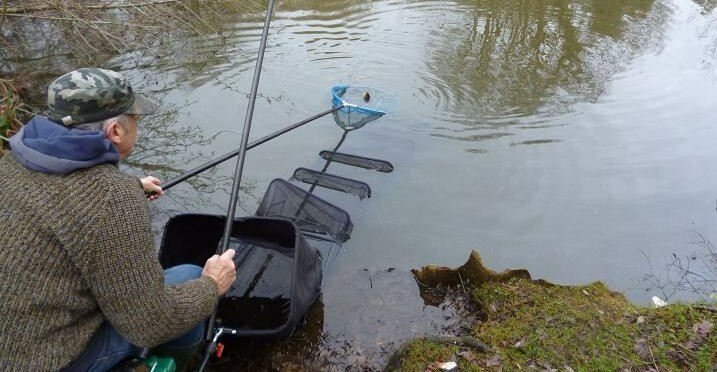 I always remove the barbs from my trebles to avoid damage and following a quick twist of the forceps he was swimming free again, none the worse for his experience. Minutes later the heavens opened again and I beat a retreat back to the van. 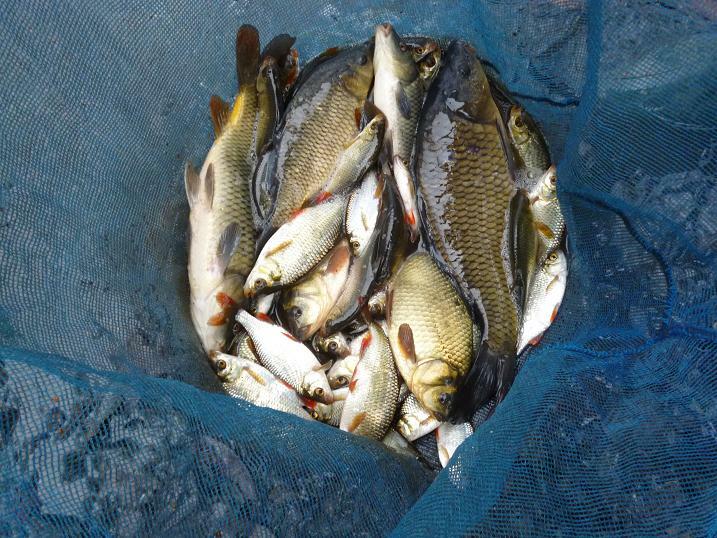 Bread punch fishing finds some winter carp and crucians. 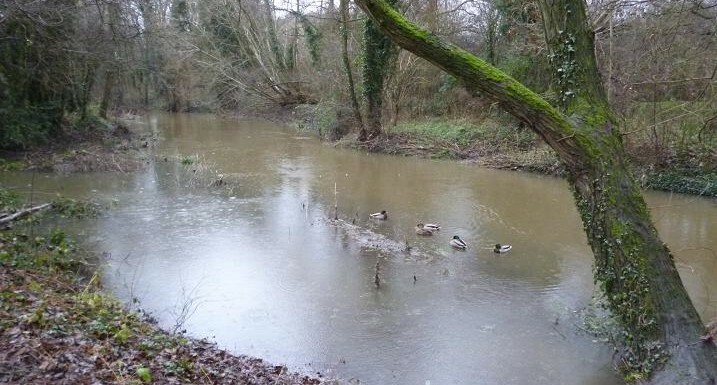 Weeks of heavy rain and strong winds had banished any thoughts of fishing over the winter holiday period, but a forecast showing a dry and possibly sunny day ahead, had me loading up my fishing trolley for the 500 yard walk to my local pond. 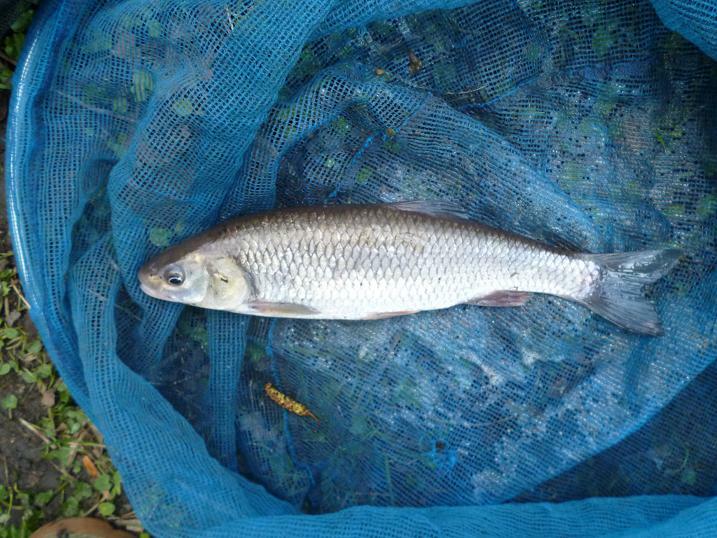 Only a few days before, fed by a stream that was in full flood, the pond was over the path and into the hedge line, but now it was back within it’s usual boundary and I decided to fish a swim that had been good to me at the height of summer. 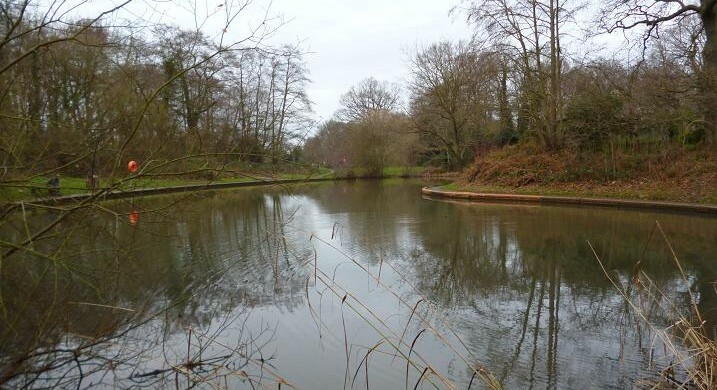 Then it had been cubes of luncheon meat, that had common and crucian carp queueing up to take my bait, but being early January, bread punch offered on a size 16 hook, under a small 2 No4 waggler was the method, fished out to the edge of a died back lily bed on six metres of pole. 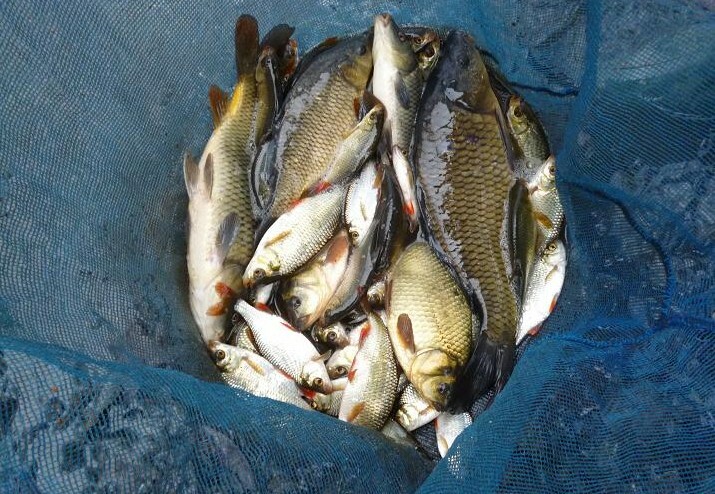 A couple of egg sized balls of liquidized bread and groundbait in a 50/50 mix, soon had the pond’s rudd population interested and after a slow start, some nice red fins up to six ounces were coming my way. After an hour of steady rudd bashing, the sun came out and the lilies began to twitch, as hoped for carp began to wake. My first one sank the float tip slowly and I lifted into a solid weight that began to move towards me. Without a fight, the No6 pole elastic was at full stretch as the carp surfaced within sight of my waiting landing net, only to explode into life, skating into and out of my net in a second, before turning and rushing at full power towards the middle. 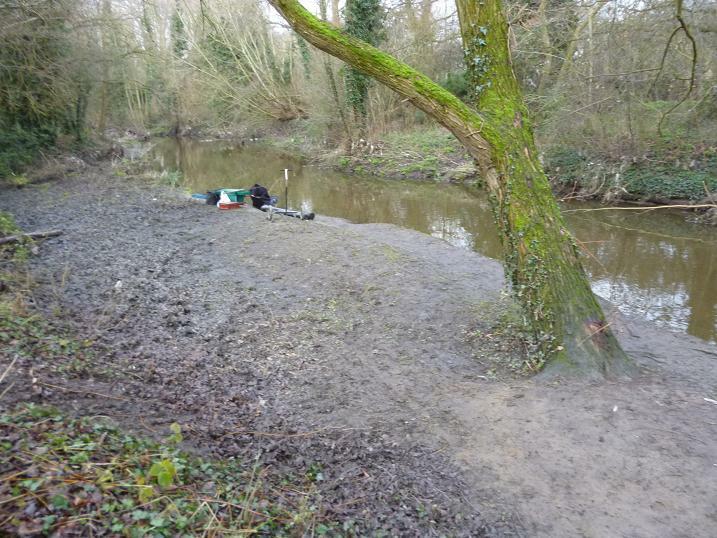 I added lengths of pole, until the full 11 meters was out following the 4lb common as it charged about, throwing up boils of black mud in it’s bid to escape. 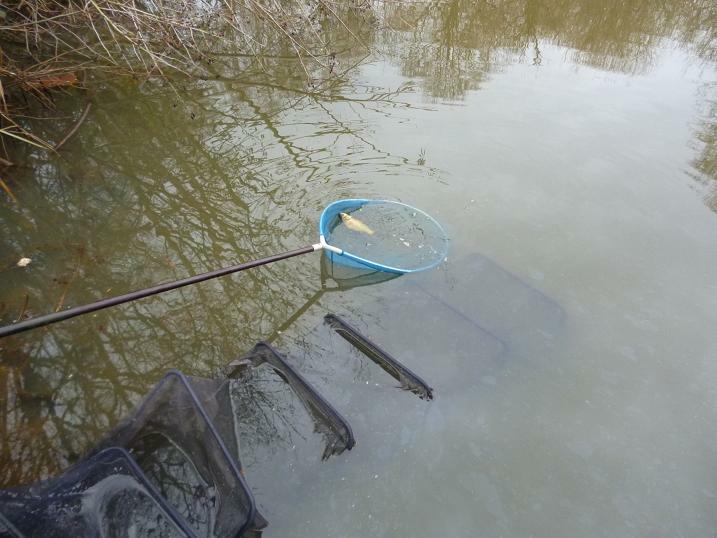 It buried itself in the lilly bed, but steady pressure brought it out again and having unshipped down to four metres was ready for the net, when the tackle flew back at me, leaving the bemused carp to swim off. My hook had snapped at the bend of the crystal hook. Very annoying! Another ball of ground bait went in as I tied on a new hook, resisting the urge to scale up to a size 14, the bites were quite fussy on a 16 and a larger hook might not work. A few more rudd, then another steady sink of float brought more solid resistance, this time from a common half the size, that woke up quickly and ran to the middle, needing a couple more pole joints to be added to break the shock of the run. With relief, the net was slipped beneath this battler. Dressed for cooler temperatures, I was sweating in the bright winter sunshine, as I took this picture, whether from effort, or from the pressure of finally landing this perfect common carp. If I’d lost two on the trot, I think I would have gone home. The carp had now moved over my feed and slight raising and lowering of the float tip indicated crucian carp lifting the No 6 shot, six inches from the hook. I bumped the first two, before setting the hook into my first. 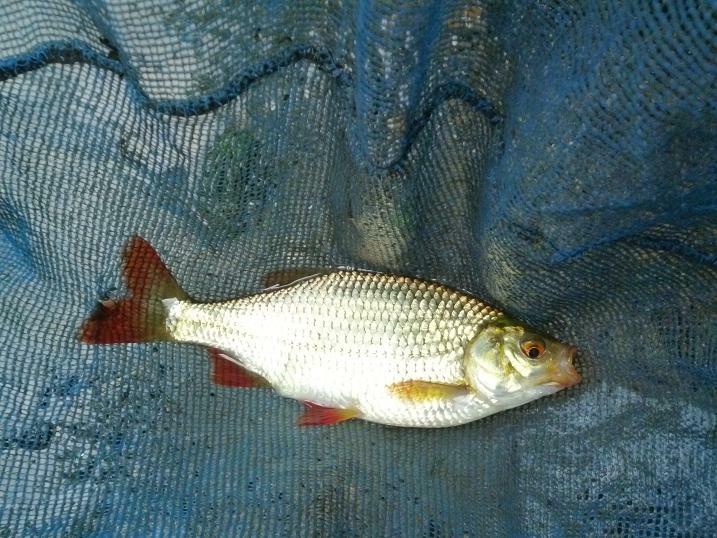 About 10 oz, this little crucian gave it’s all, but stayed on, even though the hook dropped out in the net. Sucking the 5mm pellet of punch in it’s upturned mouth, the slightest amount of pressure can pull the hook out, the float rarely going under at this time of year. 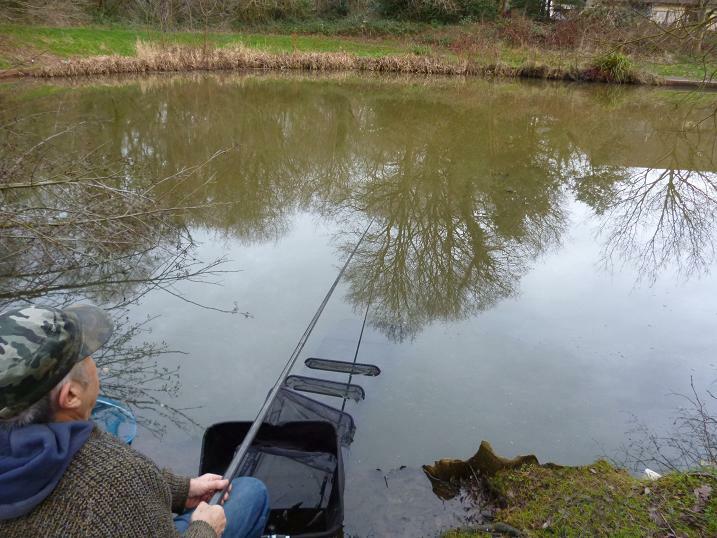 My next bite was the opposite, several rapid bobs and the float sliding away, saw the float stay down as a small fish zig zagged round the swim. 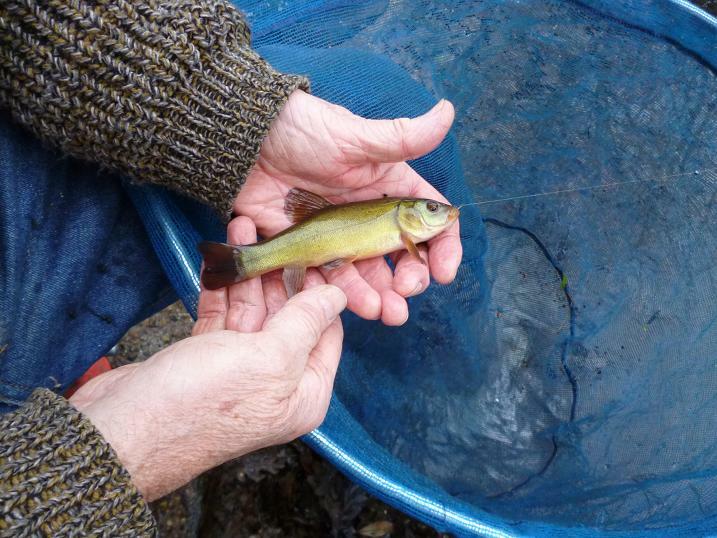 A beautifully coloured, green tench of a few of ounces needing to be netted. 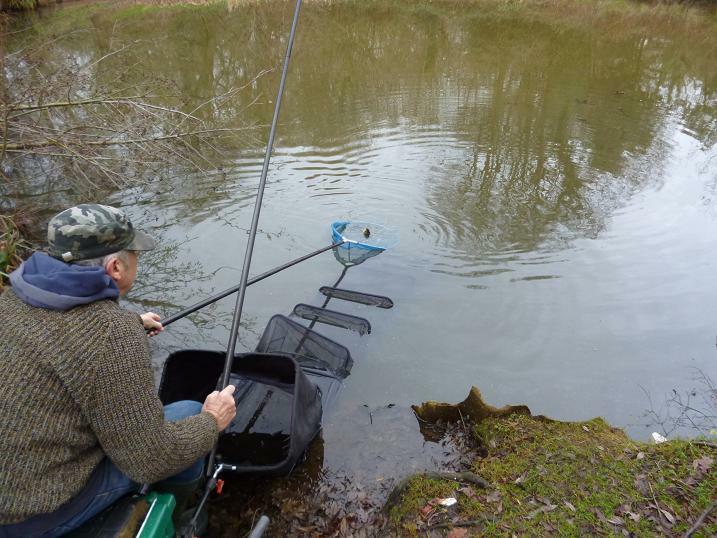 The sunshine was short lived and a chill wind began to swirl about the pond and I needed to sink the pole tip to stop the lightweight float from being moved around. The rudd didn’t seem to mind, but the carp wanted the bait stationary and an inch off the bottom. When it was right, a bite would follow and another would come to the net. I lost count of the carp, most were ounces rather than pounds and would have continued well past my lunch time, but that gusting wind now carried rain, which, with no wet weather gear, would make an uncomfortable walk home, so at 2 pm on the dot, I unhooked my last fish and unclipped my rig from the pole tip. Pulling in my net, there was the satisfying sound of sploshing fish and maybe 10lb in weight, the mixed bag of at least forty rudd with a dozen, or more carp, being a just reward for making the effort to find a dry window in what turned out to be another wet afternoon.